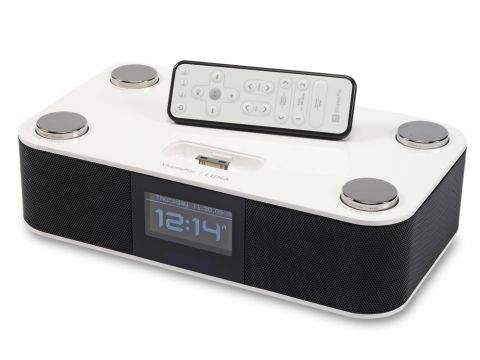 There's nothing particularly extraordinary about a digital clock radio with an iPod dock, but this one has been really well made, and has all the features you need. Some pride has gone into the design, together with great attention to detail - such as the tiny protective cap covering the dock prong. Details like this are often missed by the competition. The silver buttons on top of the unit handle the controls, and there's a good-quality remote. The remote has all the features of the onboard controls, plus the ability to scroll through iPod playlists. It even has a snooze button. Slapping the Menu button on top of the Luna brings up the onboard menu system, which appears on a blue LCD panel. This panel can be dimmed down to black by turning the Menu button, and this button is also used to scroll through the menu and setting options. It's a straightforward way to operate the system, and genuinely intuitive. The buttons are big and responsive enough to be smacked with a flailing arm, which could come in handy on those mornings when you're feeling the worse for wear. The radio is AM or FM and an aerial is provided; you'll need to attach it if you want to pick up any signal. You can set four preset stations. Around the back, a 3.5mm audio line-in jack will take a signal from a Mac or CD player, but without the alarm features. Next to the line-in are the aerial and power sockets, which are also good quality. The sound is surprisingly beefy; it's detailed enough to enjoy at low levels, and loud enough to hear at the other side of the room. It's a good, musical sound, with none of the tinny tones that some other lightweight models produce. Plan on providing some space for this unit, too, as it's almost a foot long. The price is at the top end of the market, but this offers a lot in return.